The Isle of Islay stand will be in Marquee 1, stand 14. Same as in previous years there will be samples from all the Islay distilleries available at the stand, a nice incentive to drop by. 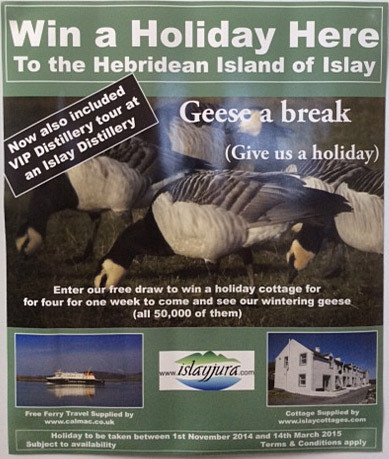 And if that's not enough, as the poster indicates you can win a stay at the Kilchoman House Cottages right during the Barnacle Geese season (and the Calmac ferry crossing). Ian (who blogs about the birds you can see on Islay on the Islay Birds blog), James, Carl, Danny and the whole crew look forward to welcoming you at the stand!